A small healthy fast food chain in the city, with some healthier options than others, Blossom du Jour serves sandwiches, wraps, bowls and salads and a good selection of cold pressed juices, smoothies and shakes. But let’s face it, I was really here for the less healthy option and was served right with the Skyscraper Sandwich, a burger with bacon, cheese, onion rings, lettuce, tomato, pickles and sauce. It was sloppy and messy and cheesy and oh so delicious. Pair it with a Blossom Butterfinger shake for a complete indulgence. It’s made with the vegan Butterfinger bars from their sister Blossom Bakery (which I urge you to visit if you happen to be in Chelsea). Bam. There are rave reviews about the veggie burgers at this little hole in the wall of the East Village and with good reasons. Look at that beast of a burger! 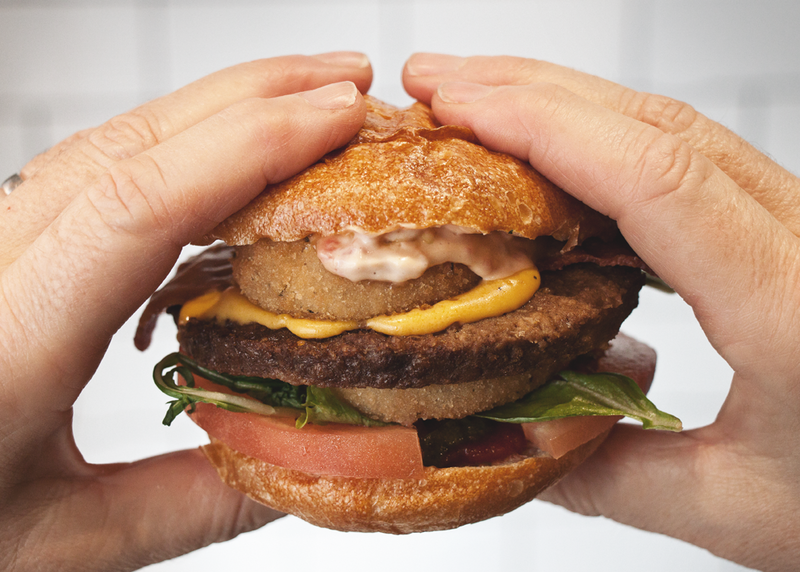 Everything here can be made vegan and their most famous burger, the Superiority Burger, is only $6. It has actually won best burger (not vegan burger) in NYC twice. There’s an amazing selection of sorbet flavors too! The Pennsy food court is worth a detour alone as it is a super cool spot for a bite or drink. So when I read that the vegan donut food truck Cinnamon Snail now had a brick and mortar location there – and that they had expanded their menu to now include a bunch of savoury items, notably a burger called Beastmode – I couldn’t keep myself from running there first thing as I got into town . And with a name like that, this burger has got to be something to remember! An ancho chili seitan burger grilled in maple bourbon bbq sauce with jalapeno mac n’ cheese (yes, MAC N’ FRIGGIN’ CHEESE in a burger), arugula, smoked chili coconut bacon, and chipotle mayo on a grilled pretzel bun, it was in fact one of the most scrumptious, over the top vegan burgers I have ever had. An all vegan cozy restaurant with a few burger options, their Green Machine Burger (pictured above) was voted “Top 10 Vegetarian burgers in NYC” “Best Veggie Burgers NYC” and it is indeed quite glorious! Roasted mushroom patty, pesto, vegan cheese, caramelized onions, guacamole, lettuce, tomato, & sprouts make for a healthier option than some of the other listed here, but it is no less delicious! 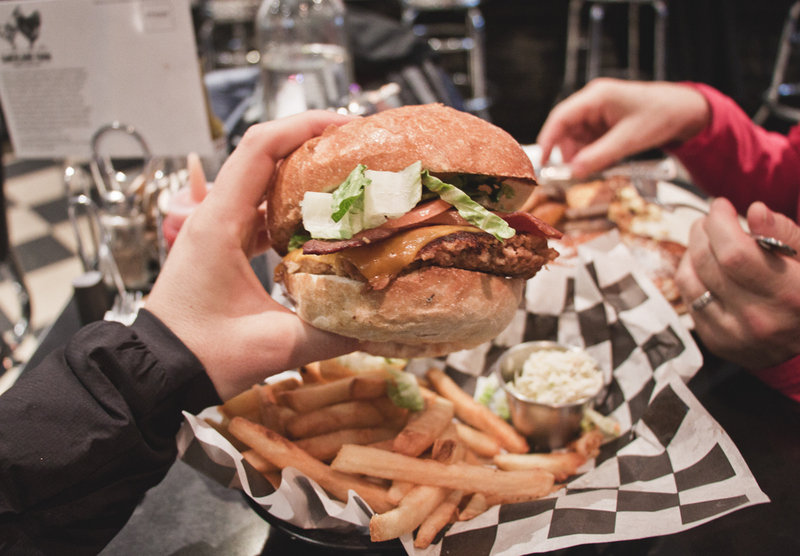 If you don’t mind visiting a place where meat is also served, something magical awaits at 5 Napkin Burger. Although the menu reads “house made with too many ingredients to count, 5n sauce, b&b pickles, multigrain roll“, I was let in on the fact that is contains barley, beans, rice, sesame seeds, jalapeños, carrots, and beets, which is what gives it its red meaty huh, whether you like that or not… You may require all five napkins! Here’s a place that was high on my list of places to revisit since I loved it so much the first time around. Champs is an all vegan old school diner with some attitude and I absolutely love it. From the irreverent wall art, to the mega cool waiting staff, to the amazing menu, this is the kind of place you will only find in Brooklyn. Menu items include the loaded breakfast burrito, drunken cowgirl, chik’n and waffles, pancakes, tempeh wings, mac n’ cheese, philly cheese steak, egg creams, ice cream floats – I mean, I could go on forever at naming all the exciting stuff on the menu. I obviously went for the bacon cheeseburger and, although not my favorite on this list, it definitely hit all the right spots with the smokey bacon and crunchy pickles. Classic! 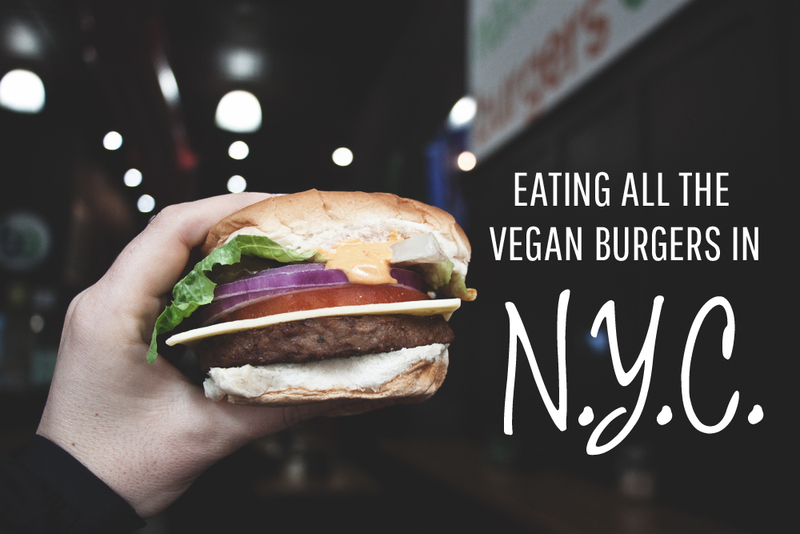 I am hoping to be back in New York soon to continue this formidable exploration of all the NYC vegan burgers but, for now, that is all I have for ya. Perhaps getting an NYC local eating guide would have helped. Next time! That was in three days, so not too bad? OMGOMGOMGOMG these all look amazing! I’ve eaten 7 burgers in the last 10 days, and counting! I was thinking of doing a Spain – the burger edition, but after seeing these my Spanish burgers are well and truly humbled. 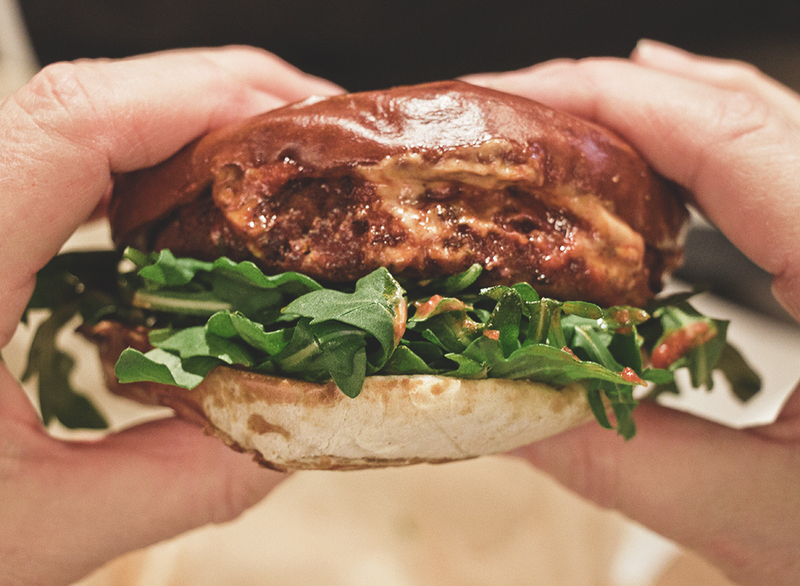 I want to do this vegan burger trail too! Must plan a trip to NYC soon. Thanks for this! Oh my, these look so good! 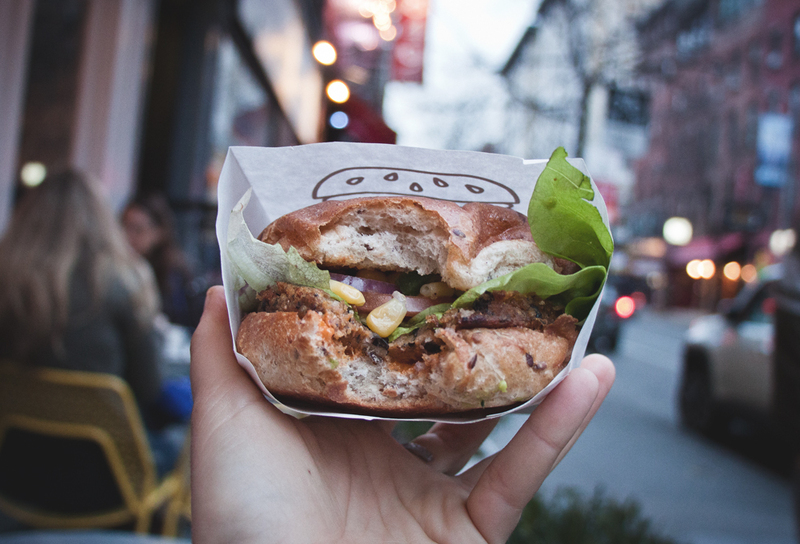 I’m going to keep this post in mind because a burger tour of New York is going on my bucket list. PS Kitchen was the best at our 7 days vegan in NYC. 246W 48th Street. Those are some of NY’s most amazing artisanal burgers. If you are in a hurry or want to see the new face of fast food, check us out at Marty’s V Burger. 134 East 27th St @ Lex. Snail makes the best burgers in town! Just a head’s up, they were never *just* a donut truck; Chef Adam Sobel has been slinging savory food for almost 2 decades now. 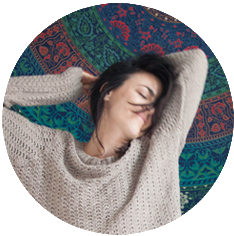 Donuts are just a gateway drug to all the vegan deliciousness the Cinnamon Snail has to offer! The first time I had the Impossible Burger was in NYC at Bareburger (so good!). I’m absolutely dying to try Champs Diner, though- guess I’ll have to make another trip up to New York!